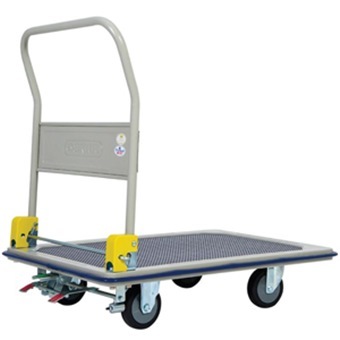 JUMBO METAL TROLLEY 370KG W/FOOT BRAKE L945*W615*H860 - HB210JCF is rated 4.7 out of 5 by 9. Rated 5 out of 5 by PeggyC from Great Feature Bought this early this month to organise our warehouse. now it's neat and tidy. Rated 4 out of 5 by Rara from GOOD SERVICE I bought the Jumbo foldable handle trolley 370kg and it was too big for my usage and have asked if i could replace to a smaller one. The customer service was patient and explained how i could change to a smaller one and use the balance amount of my first purchase. Rated 4 out of 5 by vincentc from Sturdy and good The trolley was good. Stable and study. One thing to note is that only 2 wheels can turn, so need a bigger turning angle. Rated 5 out of 5 by Nora Adam from Worth the buy ! Very worth the buy.The trolley is durable and sturdy. Rated 4 out of 5 by LSY79 from Good Product and Delivery Service I bought this trolley from this website. It was delivered on time and in good condition. The trolley was what i actually expected and is very useful. Rated 5 out of 5 by Ella from Jumbo trolley 300kg Bought for my personal usage. Ordered on monday morn n received a call same day.I was engage at work so they called me again on tues to deliver it on wed. Awesome service. Officer are friendly, service is fast n quality is great. Well recommended. Will recommend my company too..